A luxurious 6 person castle apartment with exclusive use of our riverside hot tub and sauna. The Servants’ Quarters is located on the ground floor of the Castle, and as the name suggests used to form the various stores, kitchens and communal rooms for the workers of the house. 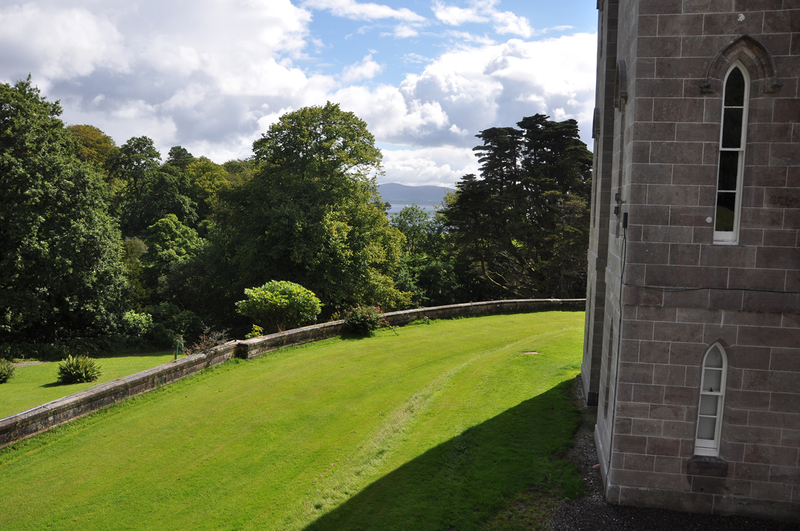 The apartment offers a superb holiday home, with private entrance leading to the castle lawns. The property has excellent views towards the sea and the Isle of Arran, and whilst technically an ‘apartment’, extends to around 1,800 sqft of space. Exclusive to guests in the Servants’ Quarters is our Riverside Spa – a fantastic wood fired sauna and hot tub by the banks of the nearby river. The Servants’ Quarters includes three bedrooms – a master bedroom with kingsize bed, feature rolltop bath and en-suite facilities, and two further twin rooms. The focal point of the property is the large and bright living room and the kitchen/dining room, with fitted kitchen, including dishwasher, fridge freezer, microwave, oven and hobs, and dining table, comfortably seating 6. Of special interest is the apartment’s very own ‘secret room’. It may take you time to find it, however when you do, you won’t be disappointed! Finished to an exceptionally high standard throughout, with Cole and Son, and Timorous Beasties, wallpaper, Octaspring memory foam mattresses, the property features central heating, fuelled by biomass, WIFI, and has all the fixtures and fittings you would expect from a luxury country home. All of our properties are well equipped with kitchen items, crockery and basic cleaning products. We also supply tea towels, oven gloves and enough tea and coffee so you can enjoy a hot drink upon arrival. We also leave a pint of milk in the fridge. Towels can be hired for £1 per person. You will be given this option on the booking form. Everyone here is very friendly. Castle and grounds are amazing. Lots more we wish we could have done if we had the time! What a fabulous place. Accommodation amazing and we have thoroughly enjoyed our own riverside spa! Would love to return to see the full restoration of the walled garden. Thanks for the warm welcome. Wow! Stunning location. The castle is beautiful. Couldn’t ask for a better place to stay. The hot tub and sauna were used every night. Thank you so much for a wonderful holiday.